There’s no single best music school. We all have different goals and personalities. The music school you choose should support your goals and fit with the rest of your life. 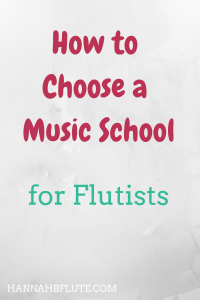 How do you choose a music school? Let’s take a look at what you should consider when you get multiple admissions offers. What’s most important to you? Do you care about the environment of the school? What about the teacher? Think about what you want your music school experience to look like. For example, I spent my first two years at a community college in a metro area followed by two years at a state school in a college town. Both schools were small enough that I was able to get personal attention. For my masters, I wanted to go to a somewhat larger school in a midsize city. That way, I would have more opportunities. And since I’m from a metro area, moving to a similar environment has made the change seem less drastic. If you don’t have a car, you will probably want to live somewhere with good public transportation. If you want to focus on school, then you might prefer a school in a smaller town with fewer distractions. In undergrad, I didn’t focus as much on the teacher, but that changed for my masters. Going into college, I simply didn’t know enough about the flute to know what I wanted in a teacher. Your specific interests should come into play, especially at the graduate level. If you want to play in an orchestra, you may want to study with an orchestral musician. I love the piccolo, so I chose to study with a flute and piccolo specialist. You’ll be spending a lot of time with your private teacher, so I would recommend getting a trial lesson. If you’ll be at a school for an audition, see if you can have a trial lesson before the audition. Another factor that will probably affect your decision is the cost. There are many ways to pay for a music degree, but that doesn’t mean it’s not expensive. If one school gives you a great financial aid package, that might sway your decision. While I don’t think you should make your decision solely on the cost, it is worth considering. Student debt can be crippling, and music isn’t a very lucrative field. That’s not to say you shouldn’t pursue music. But, if everything else is equal, think about the money you will have to pay. There are a few factors that you might take into account when you make your decision. Should you choose a music school based on prestige? What about the ensembles? If you get into a big name school like Juilliard, should you ignore every other school? While a prestigious school will definitely have great things to offer you, don’t let a school’s reputation determine where you go to school. Of course big name schools have amazing teachers and excellent opportunities, but that doesn’t mean smaller schools won’t have those things as well. One thing that could affect your decision is the opportunities they offer students. When you choose a music school, you want to make sure they have opportunities for you to learn and grow. While I was in undergrad, I played in masterclasses for some amazing flutists. I also had the chance to play in a variety of ensembles from a flute quartet to wind ensemble to orchestra. My alma mater offered an annual honors recital/competition with a scholarship for the winner. I also got to work with different pianists throughout my undergraduate career. Student opportunities are important, but you should especially look at opportunities based on your interests. If you want to be a soloist, consider the opportunity for solo competitions. Future music educators should also consider the university’s school of education. One thing I was nervous about in undergrad was moving from home. That was one of the motivating factors behind my decision to start a community college: I could live at home. In general, schools that are closer to home will probably be cheaper because of in state tuition rates. That’s not always the case if you live near the border of two or more states, though. Moving away from home is a big deal, so think about how close or far you want to be. Do you want to be able to drive home on weekends? Are you okay with having to buy a plane ticket to visit home? There are so many things to consider before you choose a music school. You have to look at all of the schools offering you admission and consider the location, teacher, cost, and more. The things I prioritized might be different than what you will prioritize. Maybe you hate the cold (polar vortex, anyone?) so you would rather stick to schools in a warmer climate. Personally, I don’t think that should be the main factor in a decision, but to each their own. If you’re in music school, how did you choose where to study? If you’re currently auditioning or awaiting acceptance letters, what else do you want to know about music school?